Confidence Man is a Quest in Fallout 4. Meet Travis Miles in the Dugout Inn after 6 p.m.
Go to the Dugout Inn in Diamond City and speak with the owner, Vadim. He will ask you to help him with the Diamond Ciy Radio DJ Travis Miles. Return to the inn after 6 p.m. where you will see Travis get accosted by Bull. Speak to Travis and afterwards, when the fight breaks out, intervene and knock out the bullies. Speak to Vadim and Travis to afterwards to sort it all out. Vadim will then ask you to convince Scarlett to go out on a date with Travis. You may try a Charisma check in this instance to more easily persuade her. Return to the inn and talk to Yefim who will tell you that Bull came back around and now Vadim has gone missing. 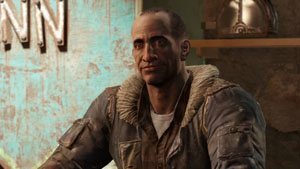 Find Travis in Diamond City and he will tell you that Vadim was kidnapped and tells you to meet him at the Beantown Brewery. Force your way in past the raiders and Bull, killing them all. Free Vadim for your reward, and speak with Travis afterwards. His future broadcasts on Diamond City Radio will now reflect his new outlook on life. Gwinnett Brew Recipe in Beantown Brewery. Can be made at the Shamrock Taphouse. Bull and gouger won&apos;t die when going to rescue Vadim I think the game still thinks they&apos;re important as they were in the bar fight, needs fixing to continue with quest! !